These are the best drone videos of Volcanoes you will ever see. Watching volcanoes is mesmerizing. We’re watching mother nature at its most powerful. Then out of the destruction comes something new. Below we have 3 videos with top drone pilot skills to capture these images. The first 2 videos come from the Bardarbunga Volcano and the Kilauea in beautiful Hawaii. The last volcano video shows you what it takes and what can go wrong when filming a Volcano. This video took some work. A flight to Reykjavik, next a 12 hour drive to a farmhouse for some rest. The next morning, another 3 hour drive over rough unpaved roads and still a good bit away from the Volcano. Lucky enough, their drone and wireless bridge equipment had enough range to capture the below 2 videos. Video created by DJI. Top piloting skills and filming of lava spilling into the ocean at Kilauea. 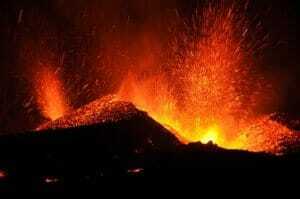 Its eruptive history has been a long and an active one. Kilauea means “spewing” or “much spreading” in the Hawaiian language, referring to its frequent outpouring of lava. DJI’s volcano video is in a series called “DJI Feats” which takes you to the remote wilderness of the erupting Bardarbunga Icelandic volcano. They use Phantom 2 quadcopters to capture wide angle images of the exploding magma caldera which is too dangerous to be approached by manned aircraft. Near the end as they tried to get closer to the volcano for even better video clips, the camera screen actually melted so they were unable to view the flight of the drone. Lucky though as the Phantom quadcopters have a “Return To Home” feature which was programmed. While the screen melted, the SD card memory with the video clips on it was fine. Read all about the latest top drones which come with 4k UHD cameras specifically designed for aerial filming. Drone technology and innovation have moved on massively over the past 2 years since the below videos were filmed. Drones like the Phantom 4 Pro have many intelligent flight modes allowing even novice pilots to film professionally.